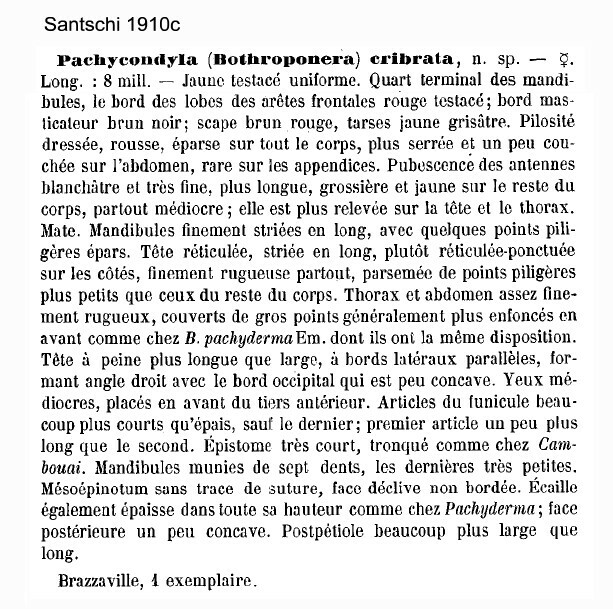 Type location Congo (Pachycondyla (Bothroponera) cribrata n. sp., Santschi, 1910c: 349, worker; revived combination by Schmidt & Shattuck, 2014: 76) collected at Brazzaville, by A. Weiss - no images on Antweb (June 2014); worker only described (see Bolton, 1995) . Santschi's (1910c) description is at . WORKER - Petiolar node sharply truncated posteriorly; head, thorax, petiole and postpetiole coarsely punctate, punctate-rugulose or striated; mandibles striate; TL 8 mm; testaceous yellow.